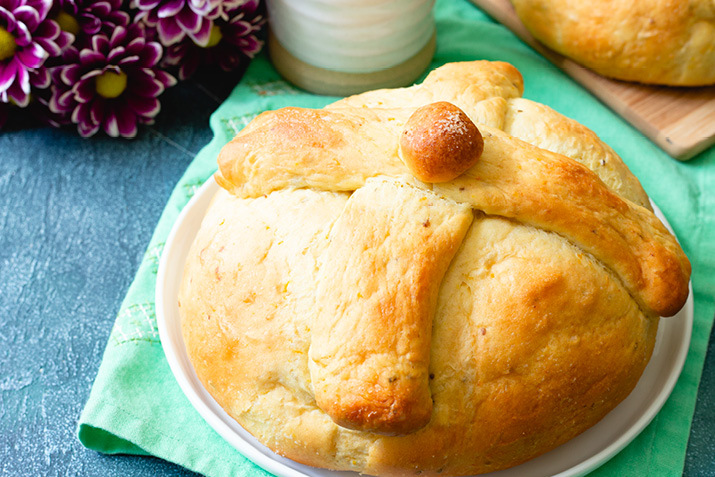 This traditional sugar-topped bread is enjoyed during the Mexican celebration Dia de los Muertos (Day of the Dead) from October 31 to November 2. Bring milk to a boil in a saucepan over medium-high heat; remove from heat, add butter, stir and allow mixture to cool to room temperature. In a stand mixer using a dough hook (see Tip for hand kneading), combine flour, yeast, 1/4 cup sugar, orange zest, anise seeds and salt. Mix well. Pour in the milk mixture with machine running on low, add two eggs, and knead until a smooth, soft dough forms. Transfer to a large oiled bowl, turn dough to coat and cover with plastic wrap. Allow to rise for an hour in a warm spot. Line a sheet pan with parchment. Punch the dough down, divide in half, and tear off a piece the size of a small baseball. Form remaining dough into two rounds, placing them 4 inches apart on the pan. Tear 2 walnut-sized pieces off the baseball-sized piece, and roll into 2 balls. Divide the rest of the dough into 4 pieces and roll into 4 8-inch cylinders. Use your fingers to shape the ends of each cylinder to resemble bones. Place all the pieces on pan next to the rounds; cover with plastic wrap and let rise for an hour. Heat the oven to 350°F. Whisk egg white with the water. Place two “bones” across each loaf in an x shape, crossing at the top, and place a little round piece on top of the x. Press gently, then brush each loaf with egg glaze. Sprinkle with sugar, and bake for about 30 minutes, checking halfway for browning. If the loaves’ tops (especially the decorations) are golden brown, cover bread loosely with a sheet of foil and return to the oven. When the loaves sound hollow when you tap them, remove from the oven and transfer to a cooling rack. To hand knead, combine flour, yeast, 1/4 cup sugar, orange zest, anise seeds and salt in a large bowl. Mix well. Add the milk in approximately 3-4 increments, mixing it in before adding more, then add the two eggs and knead the bread in the bowl until a smooth, soft dough forms.